Just yesterday a new promo poster for Iron Man 3 surfaced showing the Mark XLVII armor in some explosive action. The first Iron Man 3 trailer is just under a week away (you can now watch the first trailer online here now), but you might be able to get a sneak preview before then. 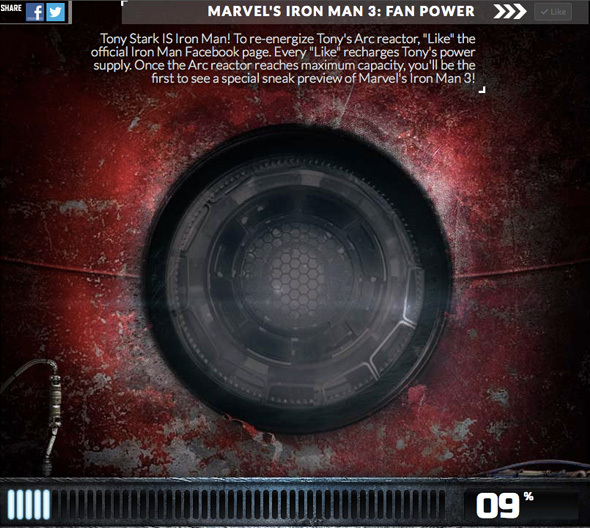 The official Iron Man Facebook page has just been updated with some activity for fans to unlock a sneak preview. With every "Like" on Facebook, the weakened arc reactor (pictured below and used in the Comic-Con footage) will charge a bit. Once it reaches 100%, a sneak preview (a trailer for the trailer - seen in full here), will be unleashed. Look! Can't wait! I have it saved in my phone. I will be there opening night! I wonder if Mark Ruffalo will make an appearance since Tony and Bruce drove off together at the end of the Avengers. I assumed Tony was gonna give Bruce his own lab/house. Can't wait to see it. the thing is...can Bruce handle working in such close proximity with Tony for so long? I'm more interested to see what Shane Black does with this material. Loved his 1980's and early 1990's stuff. Jericho- I think Bruce and Tony understand eachother better than anyone else on the team. But I think you're right. Bruce doesn't like being around people cause he thinks hes a constant danger to everyone around him. Living in the middle of the city would always have him on edge. I would still love it though if they would explain what happens to Bruce after they Avengers battle took place or where he went with Tony.